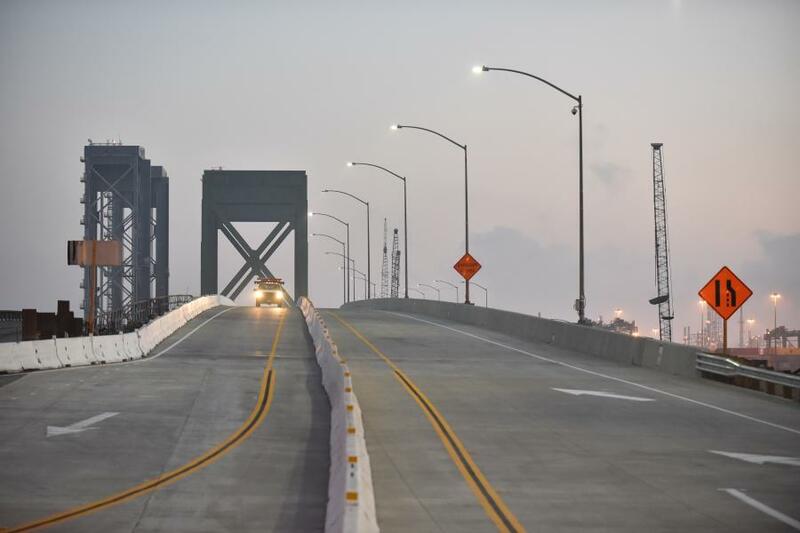 Caltrans District 7 in Los Angeles is working on a $247 million project to replace a historic, but aging Commodore Schuyler Heim bridge that was not designed for today's taller ships to pass beneath. Work began in 2011 and completion is expected in late 2020. Crews have demolished much of the original bridge, a lift-span structure built in 1948. The new bridge, now under construction, is in the same location as the old — on State Route 47 between Ocean Boulevard and a quarter mile south of State Route 102. As discussions developed about improving or replacing the bridge, it was determined that the original bridge was eligible for listing in the National Register of Historic Places. Built by the U.S. Navy, the eye-catching north-south lift-span bridge provided a link between Terminal Island and the mainland where Wilmington and Long Beach meet. Several times a day, traffic was halted to allow the bridge's metal-plate roadbed to rise elevator-style to allow ships including tugboats, sailboats and large vessels to pass beneath. The well-recognized, green-painted crossing featured two cross-braced steel towers suspended by cables. Planners determined that it would be more cost effective to replace the bridge than attempt to retrofit it for earthquake safety. So, the lift-span portion of the existing Commodore Schuyler Heim bridge is being replaced by a fixed-span bridge structure. It means the new bridge that spans the length of the channel will be permanently attached to support beams. The new bridge is tall enough to allow for tall ships to pass beneath without use of mechanical lifts. 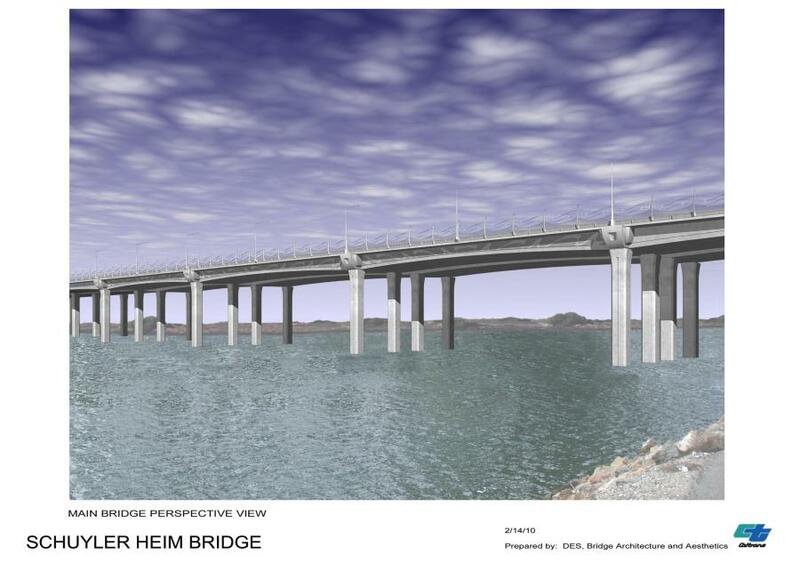 The Heim bridge is one of three bridges accessing Terminal Island and carrying high truck traffic to and from the Port of Los Angeles and Port of Long Beach. The new fixed-bridge configuration is expected to improve traffic flow for trucks and passenger vehicles. 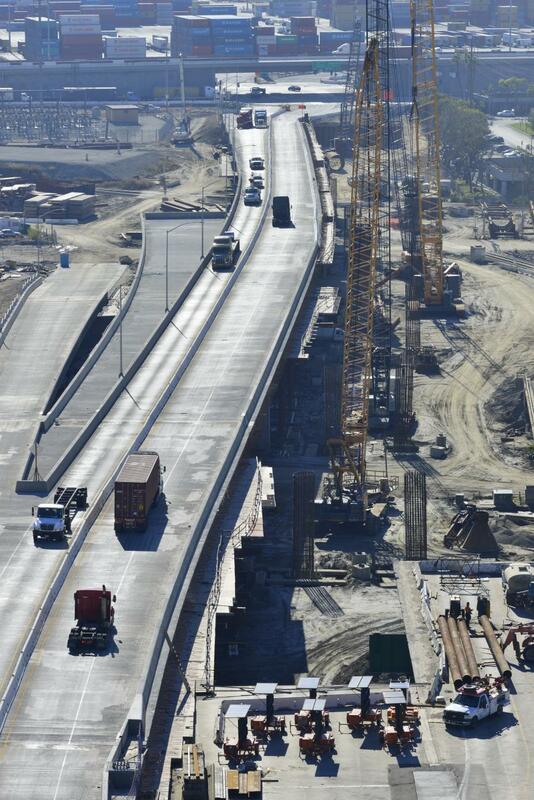 Stage 1 involved construction of the northbound portion over Cerritos Channel. Stage 2 required shutting down the northbound half of the existing bridge and shifting traffic to the existing southbound section, which is being built on the same alignment as the original structure. In Stage 3, traffic was shifted to the newly completed northbound bridge. The remainder of the existing bridge was then demolished. Crews began demolition of the Heim bridge superstructure in August 2015 and finished that part of the project in April 2016. The above-water portion of the original bridge has been demolished and the approach ramps for the new southbound bridge have largely been completed. 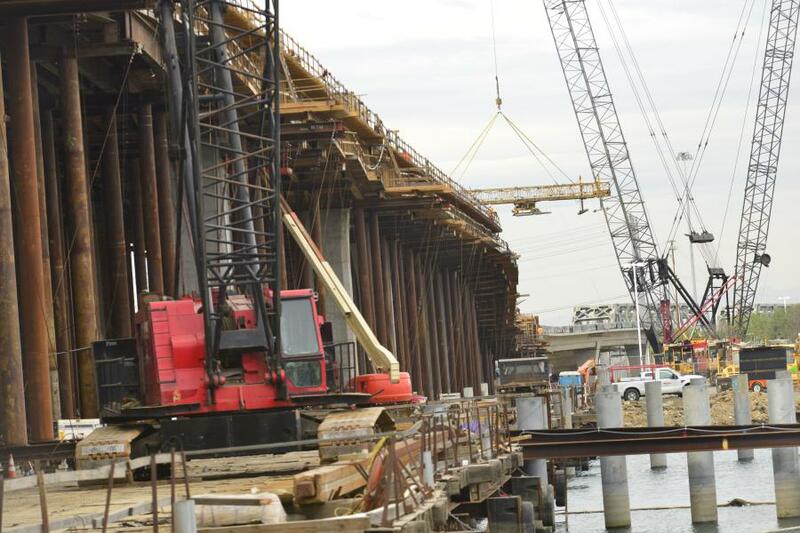 However, about 45 percent of the original bridge foundation still needs to be demolished and the new southbound span across the harbor channel must still be constructed. Low bidder for the work, MCM Construction Inc. of Bloomington, Calif., has been building bridges for 40 years. MCM was founded in 1973 as a general contractor specializing in heavy highway and bridge construction. Since then, the company has grown from a small hard-working general contractor to one of the construction industry's major bridge-builders. 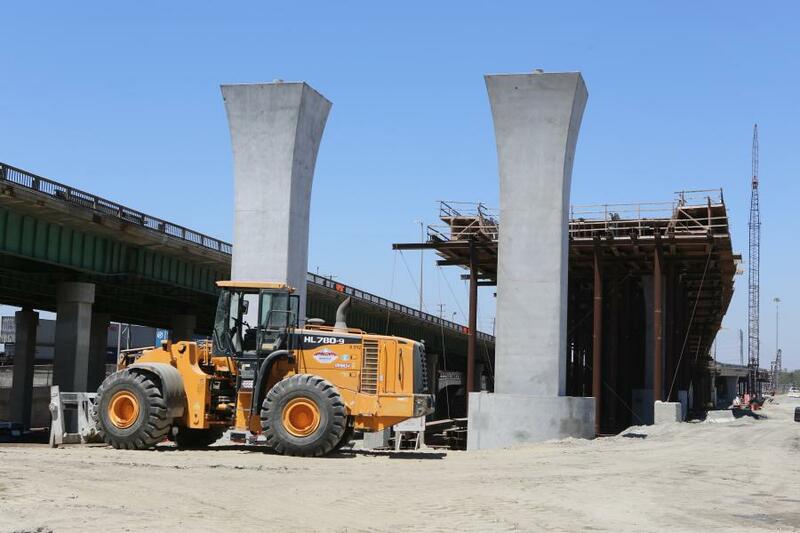 Caltrans District 7 provided design oversight and currently provides construction administration for the work. The project features about 20 subcontractors. Some of the top names include Payco Specialties (painting and striping) of Chula Vista, Calif.; Select Electric of Vista, Calif.; Ace Fence Co. of La Puente, Calif.; L. Riley Trucking & Dispatch of Harbor City, Calif.; and JAFEC U.S.A. of San Jose, Calif.
About 70 workers are at the job site during peak periods. As part of stage 3 crews will construct the southbound portion of the new bridge. Stage 4, 5 and 6 will be finishing work. The new bridge will provide a permanent navigable channel that is 180 ft. wide with a vertical clearance of 47 ft. The height is adequate for passage of ships underneath. With the elimination of the lift, traffic will no longer be delayed because of passing ships. Replacing the lift span bridge with a fixed-span bridge is expected to improve safety and benefit the local, state and national economy and international trade. 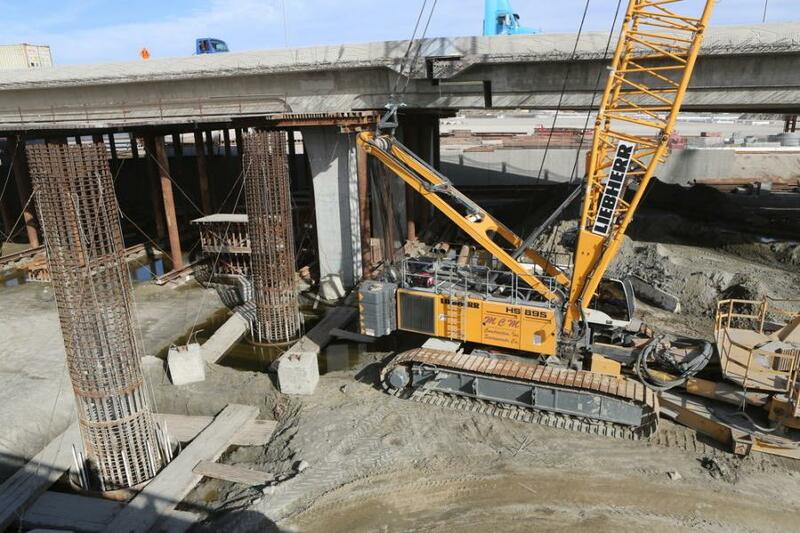 Equipment for the bridge project includes heavy-lift cranes; drilling machines; earth movers; loaders; and road pavers. Crews have used more than 10 heavy lift cranes ranging from models with 140-ton lifting capacity to top lifters with 330-ton lifting capacity. Workers will lay about 95,000 cu. yds. of concrete and 3,000 tons of asphalt over the course of the project. In 2011 the amount was set at $181.3 million. Planners envisioned the overall project including contingency and state-furnished materials to come to about $210 million. But construction alone topped $200 million. The project construction cost has increased primarily because of the complexity of constructing large and deep foundations in the marine environment. As a major undertaking including underwater work, the project also required added time for study and expert analysis. The old Heim bridge was built mostly of steel. The new bridge will be mostly concrete spanning 4,120 ft. in length. It is a fixed-height structure made from pre-stressed concrete box girders. When completed, the bridge will conform to seismic and roadway standards. It is expected to reduce future maintenance costs. Materials from the original bridge are being recycled including steel, concrete piers and roadway decks.